This cute little place in GTB Nagar behind Khalsa College is an awesome delight for Marvel and DC fans! Right from the famous dialogues on the menus to the chairs and from the action figures to the walls, the place oozes super hero fanaticism. Let&apos;s take a tour, shall we? The place is dimly lit but a big bay window allows natural light to seep in on their plush sofa seats. They also have a gaming room with two bean bags, PS3 (of course) and a projector to cater to the stress busting needs of college students. 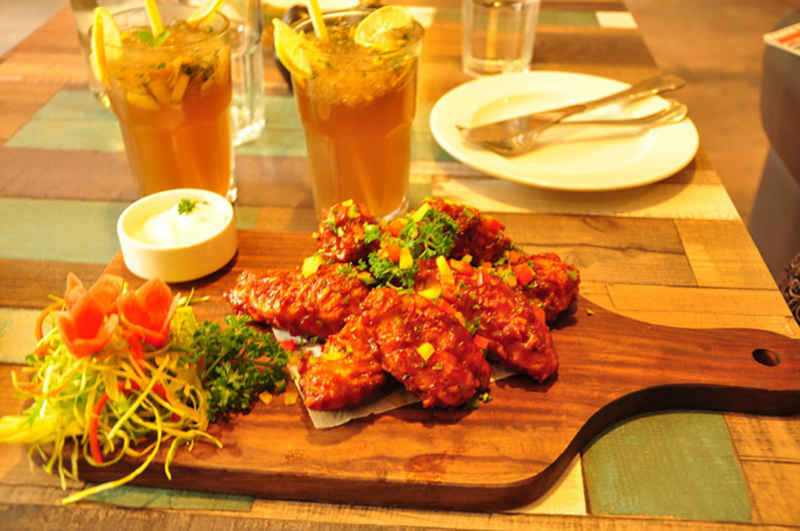 Barbeque Chicken Wings | For starters we were served their Barbecue Chicken Wings which tasted great, edging slightly towards the sweeter end and garnished well with bell peppers and coriander. Virgin Mojito | We had the Virgin Mojito to go along with our wings, which was refreshing although a little too much of lemon made the aftertaste a tad sour. 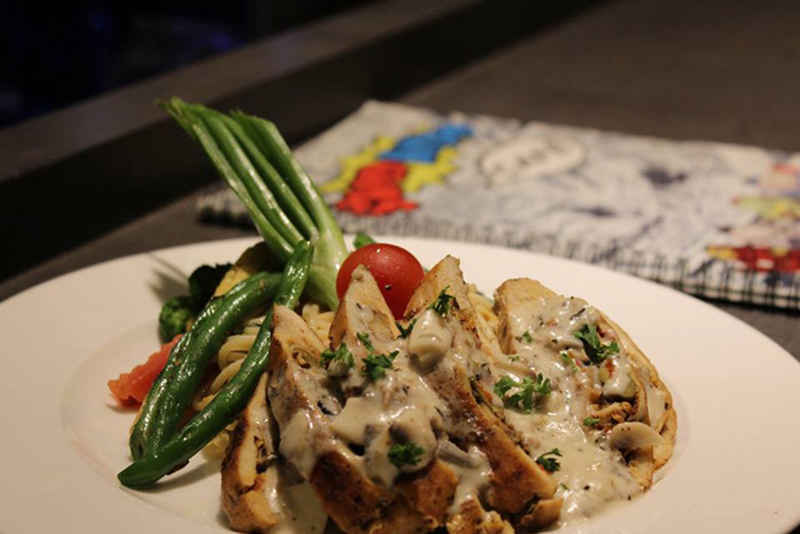 Spicy Mushroom Grilled Chicken with Noodles | Topped with vegetables like broccoli, asparagus, carrot and baby corn which was nice and crisp, the noodles alongside the mushroom and olives stuffed chicken placed on the side were a good combo. 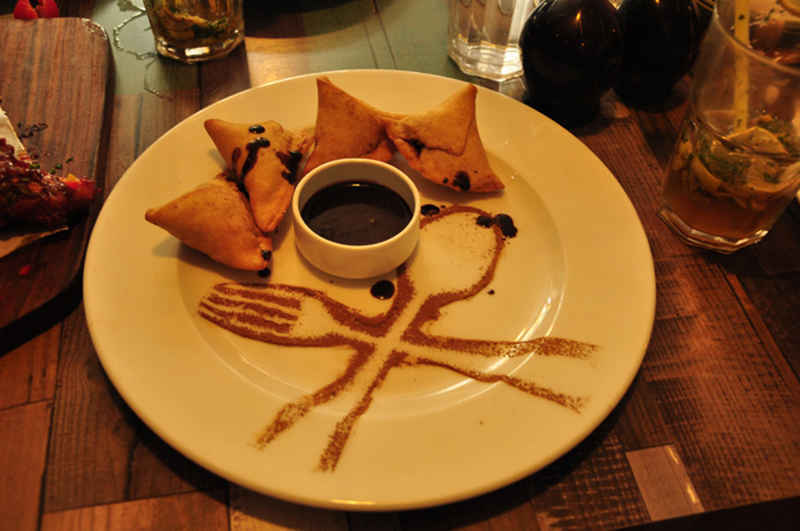 Chocolate Samosas | We ended our meal with their little Chocolate Samosas! They were really awesome, as the crisp baked dough gave way to the thick, warm chocolate core inside. They were served with chocolate sauce and are indubitably a recommendation from our end! SuperHero Cafe makes for a pleasant hangout joint for students in North Campus as it&apos;s easy on the pocket and doesn&apos;t restrict recreation to just simply eating - go check it out!